Rarely do I post a diatribe on my research blog. Actually I don’t think I ever have. But the fact that the Economist Intelligence Unit (EIU) Twitter account posted what I think is an absurd response gives me an opportunity to showcase the relevance of one of the disciplines I studied when I was doing my PhD and that I find absolutely fascinating: geography. Now, before I begin – I pay absolutely zero attention and give zero credibility to the Economist Intelligence Unit’s livability indices. I do enough research on environment and sustainability indicators to know that almost every single index has flaws. The EIU is not without its flaws. As one of my geographer colleagues noted on a list-serve I belong to (and I paraphrase) “the EIU livability index is one of those metrics designed for rich ex-pats“. To a certain extent, this is true. As noted by The Economist itself, “these rankings are used by employers assigning hardship allowances as part of expatriate relocation packages“. I have lived in the city of Vancouver, off an on, for the better part of the past 15 years. Vancouver is a city that has been consistently ranked at the top of the EIU livability index (until August 2011). A city that has numerous flaws, in the environmental, social, economic realms. A city that suffers from extreme poverty in the downtown East Side and where you need no more than do a quick Twitter search to find countless mentions of how unaffordable it is to try and live here. Yet we remain here. Why? Because our definitions and metrics of quality of life are extremely varied, and what is livable for me may not be the same definition of livable for someone else. That’s the problem with general benchmarking metrics: at some point, you need to draw a line in the sand, and because we don’t recognize the heterogeneity of livelihoods worldwide, our human consciousness attempts to group together items that show similar features. Our brain tries to homogeneize what is, in and of itself, completely heterogeneous. 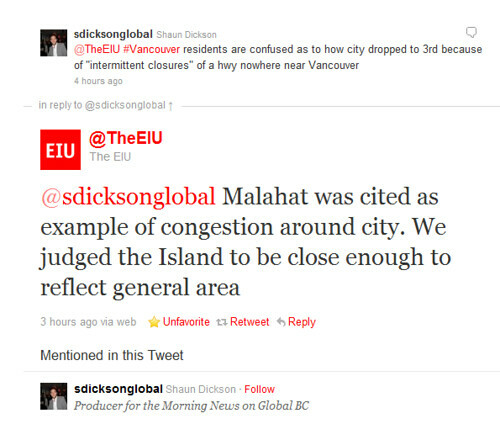 Now, I would not have paid any attention to this month’s release of EIU’s data were it not for the fact that to calculate how livable the city of Vancouver is, the EIU used the recent closures of the Malahat highway on Vancouver Island (a solid 1.5 hours by ferry from the mainland, and an additional 30-50 minute drive from Vancouver proper as well as an additional 30-40 minutes drive to get to the actual Malahat) as a measure of congestion. Please see the Twitter explanation AND the map below. I rest my case. Seriously, some people really need to learn Geography 101. My takeaway? Take any quantitative measure (quality of life, livability, sustainability) with a grain of salt. Actually, with a few scoops of salt. Think broadly (and think hard) about the implications of your analysis and its potential impact on society. As a policy analyst, that’s all I can hope people do, within the limits of our bounded rationality. Good read. Shows just how much indices like these are indeed flawed. as an islander who is also an escapee from vancouver – uh um – not – the malahat is ours not vancouver’s….and furthermore has NO relationship to vancouver and it’s livability etc. – have you even been on an island? the ferry/boat system are really the only factors that count re transportation to and fro. thanks shayne. flawed indeed. tweet that! I’m half joking of course, but without any scale (in miles, kilometers, whatever), everything looks close together on a map. 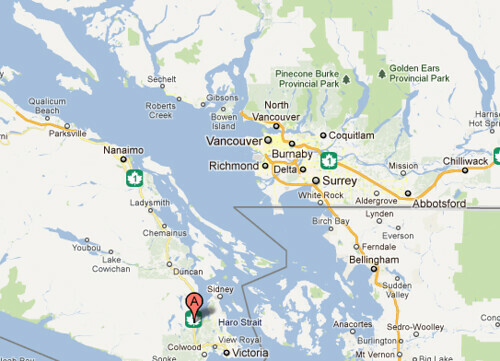 As UBC Geography alumni, this is just really bad. I mean, by this logic, traffic issues in Ireland should affect the rankings in London. Highway closures between San Diego and LA should affect the rankings of San Francisco.